On the Bauhaus photographer Lucia Moholy (1894–1989), who inspired Mary Jo Bang’s latest collection, A Doll for Throwing. Next year, Germany will celebrate the centenary of the founding of the Bauhaus, a school that stressed the unity of industrial design and all other arts. The celebration will include Moholy’s work. Lucia Moholy, Self-portrait, 1930. Bauhaus-Archiv Berlin / © VG Bild-Kunst, Bonn 2016. On her twenty-seventh birthday, at the Registry Office in Charlottenburg, a borough of Berlin, she married the Hungarian Constructivist painter Lászlo Moholy-Nagy and became, in the blink of a bureaucratic instant, Lucia Moholy. A few years later, when Moholy-Nagy was recruited to teach as a master at the Bauhaus school, Lucia went with him—she, her camera, her technical skills, and her knowledge of the darkroom. The Bauhaus, a school established in 1919 by the architect Walter Gropius, would eventually become an influential international design movement. The clean sculptural lines of its buildings, the bent steel and leather Bauer chairs, Marianne Brandt’s elegant globe-and-square tea sets would come to represent a break with the preindustrial past. 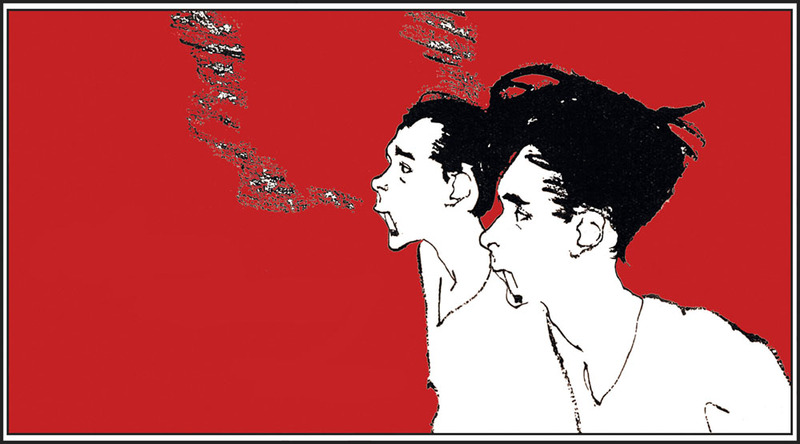 The look itself would become a signifier of urban modernity and of modern life. 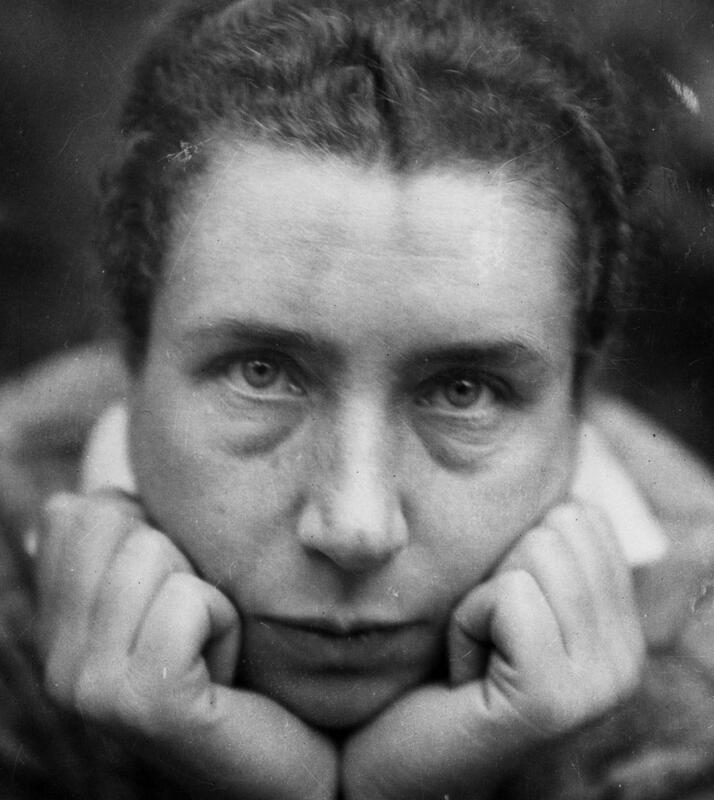 When Lucia arrived at the Bauhaus, she became, at Gropius’s invitation, the de facto Bauhaus photographer, albeit unpaid. The glass negatives would remain hers, however, presumably to do with as she wished. This was the beginning of a counter movement: photographers, after having been made over-conscious of tone values and balance, began to be more object-conscious than ever before. The object in the picture became self-assertive; and so did the details of the object. Nothing was without significance. The minuteness of detail became essential … It was the beginning of modern object photography, sometimes called “straight” photography. 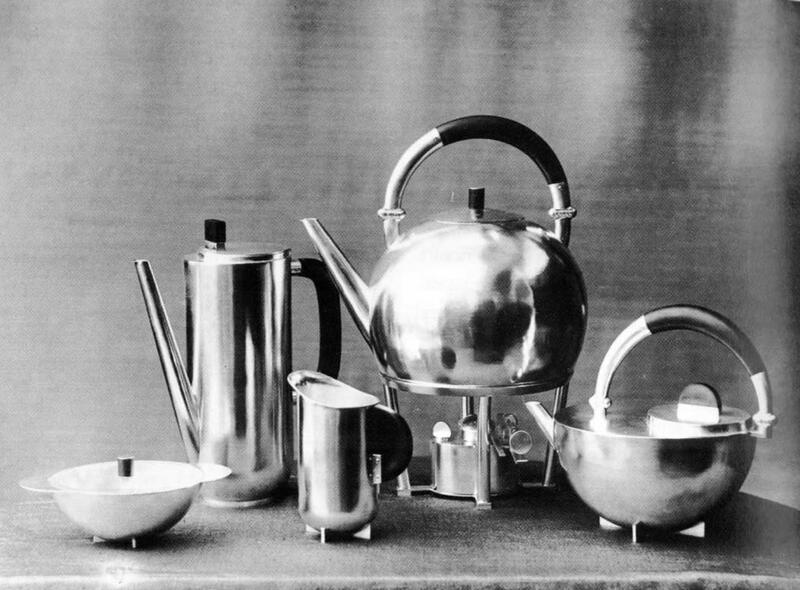 Coffee and Tea Set, 1924. Design by Marianne Brandt. Bauhaus-Archiv Berlin / © VG Bild-Kunst, Bonn 2016. When photographed objects are removed from a larger context, the photographer herself tends to disappear. Having grown used to seeing the kind of product shots that were so new then, Moholy’s photographs now read as forensic evidence of a radical moment in design and architectural history. The photograms, on the other hand, suggest an innovative authorial presence and a signature way of making art. It is much debated whether the photograms by Man Ray (Rayograms) predated or followed those by Moholy and Moholy-Nagy. Today, only her former husband’s name is associated with the photograms, even though she introduced him to photography and participated in the making of them. A photograph is said to “read,” meaning the viewer makes meaning from what is seen inside the photographic frame, somewhat like the way we make meaning from a page of text. Of course, text is not an image, but only patterned marks that represent speech sounds the eye strings together for the brain to then translate into morphemes that have meaning. Looking at a photographic image is more like taking in a gesture. The retina accepts and interprets not in the speech center but elsewhere. We attempt to match the image to what we know about the world, the way we match a hand waving to the idea of coming (hello) or going (goodbye), although gestures, by definition, involve motion and still photographs capture only a slice of the implied motion. All of Moholy’s Bauhaus images signify not only their subjects but the audacity of a new way of envisioning that belongs to her and to her sliver of a historical moment. Surface embellishment is replaced by a marriage of essence and utility. The Bauhaus designers, many of whom were women whose names are no longer known, did away with traditional curlicues and gingerbread trim. In print, the Bauhaus participants used sans serif lettering instead of German Gothic. They even did away with capital letters. Their ideas were anti-hierarchical and, to some, heretical. The craftsperson and artist were to be considered as equals, cost was to be reduced by machine production. These notions undermined the idea of a constructed social structure based on nationalistic pride, inherited privilege, and “legitimate” Aryan identity. The Nazis were having none of that. As early as 1931, the school was deemed suspect on the grounds that it was “cosmopolitan” and it was forced to move from Dessau to Berlin. After Hitler was named Chancellor in 1933, it was closed. In August of that same year, Moholy, herself a secular Jew, fled Berlin after Theodor Neubauer, a member of the Communist Party in the Reichstag, was arrested in her apartment. She left behind more than five hundred glass negatives in the care of Moholy-Nagy, from whom she had separated in 1929 but remained friendly with. But when Moholy-Nagy left Berlin, he gave Lucia’s negatives over to Gropius, who brought them with him to America in 1937, when he joined the Harvard Graduate School of Design. That same year, Moholy-Nagy moved to Chicago, where he founded the New Bauhaus. Soon after the two men emigrated to the States, they began using Moholy’s negatives to promote their own work, without her knowledge and without attribution. 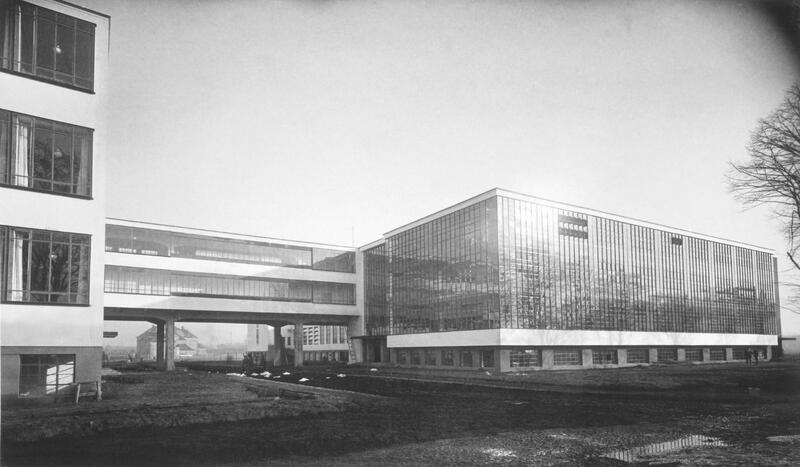 Lucia Moholy’s photograph of a Bauhaus building in Dessau, 1926. Architecture by Walter Gropius. Bauhaus-Archiv Berlin / © VG Bild-Kunst, Bonn 2016. Knowing very well that she had not given her negatives to Gropius, Moholy devoted the next three years to recovering them, including hiring an attorney. In 1957, Gropius finally returned some to her, sending them C.O.D. and in shoddy packaging, with significant breakage. For the remainder of her life, Moholy would work to have her name associated with her images. Photographs have a way of defining an era. Not only do Moholy’s photographs define the era of Bauhaus design, but they also define an era of the silent contribution of women artists. In the front of Lucia’s A Hundred Years of Photography is a brief epigraph by the French caricaturist Honoré Daumier: “Je suis de mon temps”—I am of my time. NB: Robin Schuldenfrei’s article “Images in Exile: Lucia Moholy’s Bauhaus Negatives and the Construction of the Bauhaus Legacy,” originally published in the History of Photography, details Moholy’s efforts to reclaim her negatives and deconstructs the impact of her images on modern architecture. Mary Jo Bang’s most recent collection of poetry is A Doll for Throwing, published last week by Graywolf Press. Her poems last appeared in the Review in issue no. 216 (Spring 2016).